The Veil of Veronica, or Sudarium (Latin for sweat-cloth), often called simply "The Veronica" and known in Italian as the Volto Santo or Holy Face (but not to be confused with the carved crucifix Holy Face of Lucca) is a Catholic relic, which, according to legend, bears the likeness of the Face of Jesus not made by human hand (i.e. an Acheiropoieta). The most recent version of the legend recounts that Veronica from Jerusalem encountered Jesus along the Via Dolorosa on the way to Calvary. When she paused to wipe the sweat (Latin suda) off his face with her veil, his image was imprinted on the cloth. The event is commemorated by one of the Stations of the Cross. According to some versions, Veronica later traveled to Rome to present the cloth to the Roman Emperor Tiberius and the veil possesses miraculous properties, being able to quench thirst, cure blindness, and sometimes even raise the dead. The story is not recorded in its present form until the Middle Ages and for this reason, is unlikely to be historical. Rather, its origins are more likely to be found in the story of the image of Jesus associated with the Eastern Church known as the Mandylion, coupled with the desire of the faithful be able to see the face of their Redeemer. During the fourteenth century it became a central icon in the Western Church – in the words of Art Curator Neil MacGregor – “From [the 14th Century] on, wherever the Roman Church went, the Veronica would go with it. 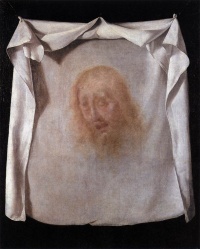 There are two main traditions for the iconography of the face depicted on the veil. One tradition (Type I), common in Italian art, shows the face of Christ as full-bearded, in pain, scourged and perhaps crowned with thorns. Another (Type II), common in Russian and Spanish art, shows Christ's face more often in repose, hair extending to shoulder length and a bifurcated beard, often surrounded by a halo quartered in a cross. Another (Type III), common in the Philippines shows Christ's face three times with hair down to the shoulder and with the Crown of Thorns. Veronica's Veil (Francisco de Zurbarán) Francisco de Zurbarán, seventeenth century. Parish Church of St Peter, Seville. Head of Christ on the Sudarium Claude Mellan, 1649. Unless indicated otherwise, the text in this article is either based on Wikipedia article "Veil of Veronica" or another language Wikipedia page thereof used under the terms of the GNU Free Documentation License; or on original research by Jahsonic and friends. See Art and Popular Culture's copyright notice. This page was last modified 18:46, 26 November 2013.